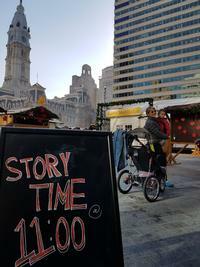 The Free Library will be returning for another festive season of Storytimes at the Christmas Village! Storytimes will be held every Wednesday at 11:00 a.m., starting today, November 28 and continuing through December 19. You can find us on the Christmas Village stage with stories and songs to be enjoyed by the whole family. The Christmas Village in Philadelphia presented by Bank of America returns to a newly renovated LOVE Park for its 11th season to put Center City in the mood for the winter holidays. 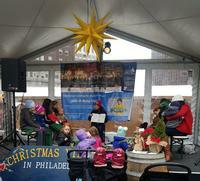 From Thanksgiving Day through Christmas Eve, Philadelphia’s largest holiday attraction will transform LOVE Park for the month into an authentic open-air German Christmas market with holiday sights and sounds featuring thousands of twinkling lights, festive Christmas decorations, live music at the main stage, children’s activities and photos with Santa presented by ACME. Be sure to check to check the Free Library's Events Calendar for other storytime opportunities happening around the city and in your neighborhood. If you have an upcoming event at which you would like a Free Library presence, please contact the Youth Services & Programs office at 215-686-5372. Add a Comment to Free Library Storytimes Are Back This Holiday Season at the Christmas Village in Philadelphia!